Lately there has been a lot of buzz about alternative treatments against different types of cancer. Many researchers all around the globe are working to bring new weapons and approaches to the cancer battle and have revealed some pretty amazing theories. The truth is what all these approaches have in common is that they are good for you and bad for cancer anyhow. Pomegranates have been dubbed nature’s super fruit and are believed to be among the healthiest fruits. They are rich in a plethora of nutrients which have amazing health benefits and regular consumption can lower the risk of many diseases. 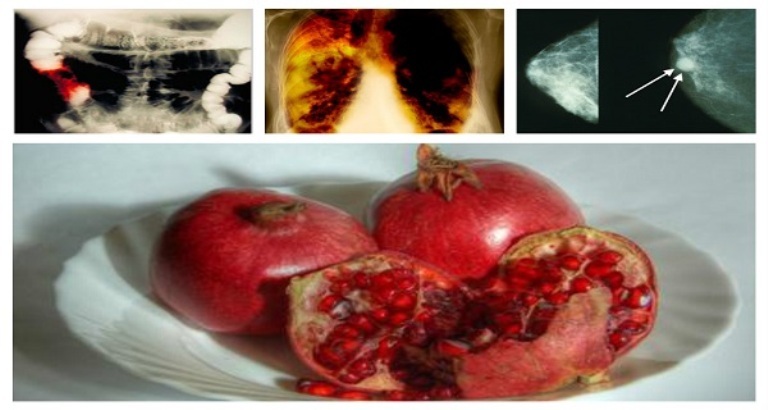 There have been numerous studies into the positive effects of pomegranates on our health and they have revealed a long list of diseases they are effective against. They have impressive anti-inflammatory properties; they can lower high blood pressure; they can help against arthritis and joint pain, they can lower the risk of heart disease, they can help with erectile dysfunction, bacterial and fungal infections, improve memory and boost weight loss. All of these health benefits are backed with extensive research, but what we are interested the most about is their effect on cancer cells, and that’s exactly what we are going to discuss. Eating pomegranate or drinking pomegranate juice can help prevent and slow the growth of certain types of cancer. Recent laboratory studies have revealed that it can slow down cancer reproduction and even cause cell death in cancer cells. Pomegranate’s rich biochemical composition of antioxidant tannins and flavonoids has become the main subject of many scientific researches. Recent research has proven that pomegranate extract can stop the proliferation of breast, prostate, colon and lung cancer cells in culture. The Clinical Cancer Research in 2006 published a research conducted on men who already had been treated for prostate cancer but whose PSA (prostate specific antigen) levels were still raising. They drank 8 ounces of pomegranate juice per day for 33 months. During the study, the rate of increase slowed in 83% of the men. Overall, the PSA doubling time increased from 15 months to 54 months (men whose PSA levels double in a short period of time have a higher risk of death from prostate cancer). This is all due to the high levels of polyphenols, isoflavones and ellagic acid, compounds which can be very effective against cancer. Israeli researchers conducted a study which revealed that pomegranate extract can prevent the reproduction and boost the self-destruction of breast cancer cells. The study showed that a group of phytochemicals called ellagitannins, which are found in abundance in pomegranates, suppress the production of estrogen. This in turn stops the reproduction of breast cancer cells and the growth of estrogen responsive tumors. These phytochemicals act in such way that they prevent the production of aromatase – the key enzyme compound of estrogen which plays a major role in the growth of breast cancer cells. The University of Wisconsin-Madison conducted a study which showed that eating pomegranates could help reduce the growth and spread of lung cancer cells, and even stop lung cancer from developing. All of these health benefits indicate that we should try to include pomegranate fruit and juice more in our diet. If you opt for a juice always buy 100% organic pomegranate juice, avoiding the added sugars. But maybe it’s even better to add fresh pomegranate to your diet because the seeds inside a pomegranate are loaded with antioxidants and contain fiber, vitamins C and K, and potassium. Half a cup of pomegranate seeds (which is the equivalent to one fruit) has just 72 calories. Add them to your breakfast dish, muffins or enjoy them on their own. They are delicious and extremely healthy.